"Delightful baked halibut breaded with a spicy mixture of Dijon mustard, horseradish, fresh Parmesan cheese and bread crumbs." In a small bowl, mix together mayonnaise, mustard, horseradish, and lemon juice. Stir in 1/4 cup bread crumbs and 1 tablespoon Parmesan cheese. Arrange fish fillets on the prepared baking sheet. Spread bread crumb mixture evenly over fish. In a small bowl, mix together melted margarine, 1/4 cup bread crumbs, and 1 tablespoon Parmesan cheese. Sprinkle over the coated halibut. 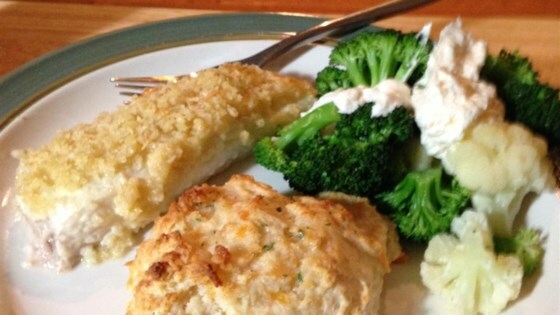 Bake for 15 to 18 minutes, or until fish flakes easily with a fork. This was great! I used fat free mayo and extra virgin olive oil in place of the butter and it was delicious and healthy. Thanks for the great recipe! Quick, easy, and very tasty! It's a keeper! Made just as is and actually only cooked 2 fillets but the same amount of sauce and topping as my husband likes sauces--this is divine!